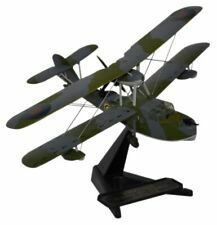 Diecast Aviation Model. 1:72 Scale Diecast Model. Greece = £35.00. Portugal, Estonia, Latvia, Lithuania & Sweden = £30.00. Denmark, Spain, Austria, Czech Republic, Finland, Hungary, Norway, Poland, San Marino, Slovenia, Slovakia & Switzerland = £25.00. P5658, AIR SEA RESCUE SERVICE. Spain, Italy, Austria, Switzerland, Portugal, Luxembourg, Slovakia and Czech Republic, £18.00 up to 20kg. The superb Atlas Editions "Battle of Iwo Jima 1945" 1/72 scale Fleet Air Arm WWII Supermarine Seafire fighter. The model was made by Oxford Diecast for Atlas Editions. Diecast Aviation Model. 1:72 Scale Diecast Model. France, Italy = £20.00. Belgium, Luxembourg, Holland, Germany = £12.00. Ireland = £17.00. Stand Included. Greece = £35.00. Portugal, Estonia, Latvia, Lithuania & Sweden = £30.00. The characteristic RAF roundels and its RAF PR-F X4590 identity are all faithfully replicated as they appear in real life. It is made by Oxford Diecast and is 1:72 scale (approx. 14cm / 5.5in wingspan). Pilot - Sgt R Havercroft. Supermarine Spitfire MKI. Only for sale to reduce my own bulging collection. That will also be on sale soon. The superb Oxford Diecast "History of Flight" 1/72 scale RAF Supermarine Walrus in the livery of 276 Air Sea Rescue Squadron. 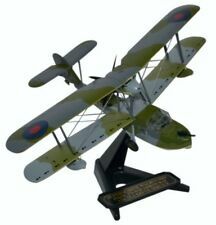 Oxford says:The Supermarine Walrus was a British single engine amphibious biplane reconnaissance aircraft, designed by R.J. Mitchell who was also responsible for the illustrious Spitfire. The set comprises a Fleet Air Arm Supermarine Seafire & a Japanese Kawasaki KI.61 Hien fighter. The superb Atlas Editions Duelling Fighters Collection "The Battle of Iwo Jima" set of 2 1/72 WWII war planes. AC001 - Supermarine Spitfire Mk1 - Sgt R Havercroft 92 Sqn 1940. 1:72 scale - wingspan is approx 155mm. OPERATION TORCH NORTH AFRICA 1942 72SW004. The Supermarine Walrus was a British single engine amphibious biplane reconnaissance aircraft, designed by R.J. Mitchell who was also responsible for the illustrious Spitfire. Oxford Diecast. History of Flight. Presentation stand to display the aircraft "in flight". MINT IN BOX. Supermarine Seagull Mk V RAAF, G-AKIU. Oxford Diecast. History of Flight. Presentation stand to display the aircraft "in flight". Realistic panel lines, antennas, access panels and surface details. MINT IN BOX. Subject: Henry Cozens RAF No.19 Sqn. Type: Spitfire Mk I Airplane. Supermarine Spitfire Mk I RAF, X4590, RAF Hendon, England. Oxford Aviation. Permanently retracted landing gear. Material Diecast. Scale 1/72. Ending Soon. New Arrivals. The RM Toys Team. Kind Regards. Our aim is to ensure no matter what the model, we will provide an excellent service experience. Pictured here is a 1:72 scale replica of a USAAF Supermarine Seagull Walrus reconnaissance aircraft that participated in Operation Torch, the invasion of North Africa, during late 1942. New for 2019! Supermarine Spitfire Mk1 - 1/72 Scale Diecast Model As flown by Pilot Sergant R Havercroft No 92 Squadron 1940 Metal and plastic construction Comes boxed with display stand Part of the Oxford Frontline Fighters Collection . Subject: A2-4 RAAF. Type: Seagull Mk V Airplane. Subject: RAF No.276 Sqn. Type: Walrus Airplane. Spitfire MkI - Pre-WWII. 19 Squadron RAF 19 Squadron was the first flying squadron of the RAF to receive the Spitfire MkI in August 1938. Here it remained during the inter-war years flying a variety of bi-plane fighters until the arrival of their Spitfires. 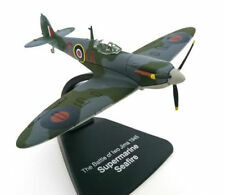 Supermarine Spitfire Mk1 - 1/72 Scale Diecast Model. Part of the Oxford Frontline Fighters Collection. As flown by Pilot Sergant R Havercroft No 92 Squadron 1940. Subject: N3277 Luftwaffe Rosarius Circus Captured Aircraft. Type: Spitfire Mk I Airplane. Subject: AR212 RAF No.57 OTU. Type: Spitfire Mk I Airplane. Material Diecast. Scale 1/76. Our aim is to ensure no matter what the model, we will provide an excellent service experience. Ending Soon. New Arrivals. The RM Toys Team. Kind Regards. MINT - The item is in perfect condition. The Supermarine Spitfire is a British single-seat fighter aircraft that was used by the Royal Air Force and many other Allied countries during and after the Second World War. It was also the only British fighter to be in continuous production throughout the war. The Supermarine Spitfire is a British single-seat fighter aircraft that was used by the Royal Air Force and many other Allied countries before, during and after World War II. It was also the only British fighter to be in continuous production throughout the war.